Here's a question about landscaping privacy, creating a landscape screen and also fast growing trees. I have a farmhouse on an open field in northwest PA, and would like to provide some wind screening as well as an attractive privacy "wall" from the front road. I'm thinking of evergreens. What's the fastest growing tree you'd recommend for such? There are a few fast growing trees, but perhaps not the best in the long run. The first is Leyland Cypress. Do you know your plant zone? If not, send me your zip code and I'll get it for you. Leyland Cypress will grow only as far north as Zone 6A. They are fast growing, but have a bit of an odd shape for my taste (you might like them). The other is White Pine. They should be fine in Pennsylvania. They are pretty graceful evergreen trees and grow quite fast. Over time, however, they will lose many of their bottom branches. Visually even though this happens they are still attractive. However, it does open up that space so their use for privacy and wind breaks is diminished. An option is to plant some tall evergreen shrubs in front of them either now or down the road. My favorite is Norway Spruce. They are beautiful, elegant and majestic with age. They will provide an excellent screen and an added bonus is that they are deer resistant. However, they are slower growers. You might consider a mix of some or all of these evergreens depending on how long of a distance you want to cover. Plant them in groups if you choose this route. Join in and write your own page! It's easy to do. How? Simply click here to return to Landscape Design Questions & Answers. I have 2 huge evergreen Spruce trees in my front yard and nothing grows there. The lawn is so sparse that we hardly ever mow it. I'd like to plant shrubs there,and bark chip the whole area. Will my shrubs grow,or can I plant them in containers? We live in Central Alberta and our zone is 3-4. Which shrubs might work best? I enjoyed your site very much. It has lots of info. Thank you for the compliments on my site. You might consider planting the area with groundcover. Ajuga would most likely do fine since it is rugged. It takes sun or shade and can be somewhat aggressive...which is good as it will work hard to cover your area. There are lots of varieties. Some have bronze foliage, others green, and some purple. It's evergreen. I like your idea of pots. You could use a few large ones, adding them to the groundcover area. I am not sure how much, if any, sun you get, but you might consider using perennials in the pots for texture and color. Hosta, which takes shade, is very hardy. If you bought really nice pots, they in themselves, could be features during the winter. Plant them with annuals for real color all season. Lobelia will take the shade. I have a Lobelia in a pot on my porch and it is absolutely my favorite plant. of the page for the picture. It's really much more of a vivid blue! I hope this was helpful. If you have any further questions, just let me know. I have several, tall maple trees in the back yard. These trees are very tall (more than 50 ft). In winter, the trees are without leaf and do not look nice. I would like to plant a few more trees near the property boundary for improving the privacy and also to improve the look. The soil in this area is clay-like and wet. The area is partly shady, partly sunny. Could you please suggest some trees (preferably evergreen) that would do well in this situation and also will look good with the existing tall trees. I would greatly appreciate it. First, I would amend your soil. Add some good compost, or a mixture of topsoil, sand and peat moss, so that the quality and texture of the soil is improved. This will help whatever you plant there. I don't know where you live, so please check your your plant zone and that of any plants you may choose. Now, on to the plants! If you have the room, and if the plant zone is appropriate, one plant you might consider is the Hemlock. This is an evergreen tree that will take some shade. Along with those, you might also add some Rhododendron in groups. They are evergreen too, and would provide some flower color. The difference in plant textures would be very attractive. I built a home in a new subdivision. My backyard backs up to a pond which people often walk around. My neighbors often walk (or even ride bikes!) through my backyard since there is no real distinction between my property and the community area...every house around the pond is in the same situation. How can I define my property border without sticking out like a sore thumb? 1. How about adding a planting bed along your property border. By planting low shrubs, you could still keep the view to the pond open. A combination of shrubs and perennials would form a definition and also provide something nice to look at from your house. The bed can be either straight or curvilinear. 2. Another idea is to install some very low fencing. This could have groups of plants on one side of the fence or both. If either of these ideas appeals to you, let me know and I can offer some plant suggestions. If they won't work for you, let me know why. It's hard to give ideas without a picture. Jamie, you have to read the Rules and Regulations of the Home Owners Association. Many times the land around the pond is a community feature. You have to find out if you can add shrubs etc. Sometimes there is a provision in there where you can if you get permission from the governing board. Thanks, for your comment and bringing that up. She must know where her property line is first of all. After that, there may or many not be planting rules, or any other rules for that matter, IF there is a Homeowner's Association. She did not mention this. The land adjacent to the pond may be under the jurisdiction of a Homeowner' Association, the town/city or county. A city or county seldom specifies what you can or can't do regarding planting on your own property, but a Homeowner's Association certainly can and often does. I have four Maple Trees (two red and two green) planted 10 feet apart in a straight line in front of my house at the end of the lawn near the road. What trees would look good with these Maples to create more privacy? Do I plant them in front of the Maples or in the back? If you have the room you could use evergreen trees. They would provide privacy, greenery in the winter, and a nice background for the Maples. Norway Spruce take up a lot of room but are very nice. If you have just a small space, consider a hybrid of the American Holly, Nellie Stevens or Foster Holly. They stay quite narrow and do not get all that tall. Whether you plant the trees on the street side or the house side depends on the room you have and also which view is more important. For example, if they are placed on the street side, you will view the nice Maples up against the evergreens from your house. This would be my choice. I want to plant a privacy screen of evergreens. I live in San Antonio, TX, with a lot of rocky, limestone soil. I need a screen that stays about 3-4 feet wide, hopefully with little pruning. Help! Probably the most narrow ones would be certain varieties of Eastern Red Cedar. You can find some that are 3 to 6 feet wide. If you can go wider, about 6 to 10 feet, you could use Southern Magnolia "Phyllis Barrow', a slow grower. Foster Holly or Nellie Stevens Holly would also be about 6 to 10 feet wide and grow pretty slowly. These are all nice choices. Depending on how long of a screen you need, you could use one variety or group a few different ones. If you have further questions, just let me know. Looking for evergreen trees that love water. These are pretty wide so you would only need 1 to 3. You could also use Arborvitae. These are very narrow...usually around 2 to 3 'but are slow growing like the Holly. They would be more of a hedge rather than just a couple of wider evergreen trees. If you have the space, you could stagger the Hollies or the White Cedars to make it more attractive and take up less room in the width (but more in the depth). From our back porch we look out over the back pasture and enjoy watching the goats and an occasional deer. 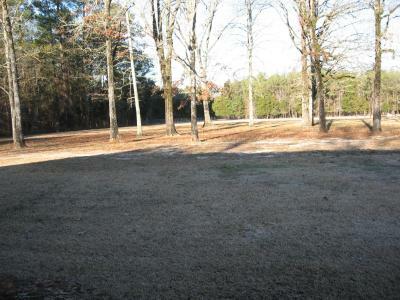 However, our backyard landscaping is pretty plain, just grass, then trees to the pasture beyond. We would like to define the back yard without obstructing our view to the pasture. We'd rather not just do the rectangular low hedge around the perimeter of the grass. Instead, we would like to use varying heights of vegetation in a semicircle or curved pattern to make the backyard smaller, while keeping the expansive view beyond. My wife likes Pride of Mobile azaleas. I wasn't sure if they would grow under the oak trees. We live in Montgomery Alabama and have a lot of prairie soil. Any suggestions? I agree with some of your thoughts regarding backyard landscaping of your property. I would create a curvilinear bedline. Do this by following the natural curve of the groups of trees. You can place somewhat low plantings to keep your view to the rear of the trees clear. I believe the Azalea would work, as it is rather drought tolerant and will also take some sun. In addition, you could add masses of Willowleaf Cotoneaster, Junipers, Fountain Grass (great for a prairie look) and lots of groups of Coneflower for color. To fill in, try planting Ajuga. This is a groundcover that will take sun or shade and is fast spreading. Use a variety with colorful foliage. You can still add a few plants for height for additional interest. If you place a couple here and there, your view will not be blocked. Even consider an ornamental tree that you like placed towards the side. "Susan, what a pleasure it was to work with you. You made me feel like I was your only client - responding late at night and always so quickly! Your design is amazing and we only hope we can do justice to it when we plant. You have such fantastic ideas and you are so open to suggestions and changes. Loved working with you - now if you could only come to Canada and plant it!!!" If you enjoyed this page, please share it!